On the end of January 2016, PT Pertiwi Agung had annual meetings for the commercial team, which was attended by Area Supervisor (AS) and Area Sales Manager (ASM) in west Indonesia and east Indonesia. According to the theme “Together We Can Make A Giant Step”, the meeting has discussed about the working performance of the year 2015 and the targets to be achieved of the year 2016. 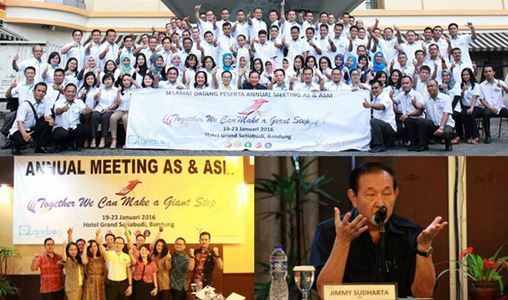 The annual meeting for West Indonesia Area was held on 19-23 of January 2016 at Grand Setiabudi Hotel—Bandung and attended by 87 AS and ASM. And, the annual meeting for East Indonesia Area was held on 25-29 of January 2016 at Luminor Hotel—Surabaya and attended by 56 AS and ASM. Also participated in both meeting, there were Mr. Jimmy Sudharta (CEO of Mensa Group), Mr. Hindrianto Lukas (Chief Marketing Officer of Mensa Group), Mr. Stephanus Djohan (General Manager Commercial of PT Pertiwi Agung), and Mr. Indrij (General Sales Manager of PT Pertiwi Agung). They encouraged all of the participants to work together with “Strength Based Teamwork” as the concept to maximize the achievement in 2016.